Those citizen scientists were highlighting measurements of star brightness recorded by NASA's Kepler spacecraft. Tiny dips in a star's brightness can indicate a planet is passing in front of the star. That's how Kepler astronomers – and citizen scientists using the internet to help analyze the light curves of stars – are looking for planets. But this star had deep dips in brightness – up to 22 percent. The star's brightness also changed irregularly, sometimes for days and even months at a time. A search of the 150,000-plus stars in Kepler's database found nothing like this. 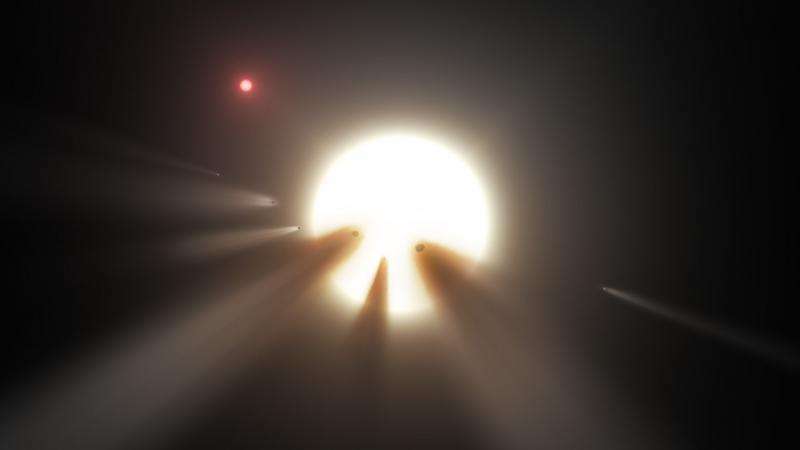 "The scenario in which the dimming in the KIC 8462852 light curve were caused by the destruction of a family of comets remains the preferred explanation …," wrote the three – Marengo; Alan Hulsebus, an Iowa State doctoral student; and Sarah Willis, a former Iowa State graduate student now with the Massachusetts Institute of Technology's Lincoln Laboratory. When the Iowa State astronomers studied the star with Spitzer infrared data from January 2015 – two years after the Kepler measurements – Marengo said they didn't see much. If there had been some kind of catastrophe near the star, he said there would be a lot of dust and debris. And that would show up as extra infrared emissions. "We didn't look for that," Marengo said. "We can't really say it is, or is not. But what the star is doing is very strange. It's interesting when you have phenomena like that – typically it means there's some new physical explanation or a new concept to be discovered." A light curve caused by the destruction of a family of comets would repeat at approximately equal intervals. Well, is it? Are they not keeping track of this star since then? Have the dips in brightness stopped entirely, or continued? If they've stopped, any "alien structure" theory likely goes out the door, doesn't it? Would a string of comets cause us to lose that much light, 22 percent of output, if this was with our own sun? Seems unlikely. Another "Haw Haw" farcical so called 'explanation' that can only be 'accepted' by coercion. What do these holdeovers from the 'Blue Book' days fear? Why are these patent big lies being peddled to the monopoly mass media? Why does the mass media print them? No one in their right mind will continue to believe this crap that is so bad that any public speaker would have to soak his face in wet cement and let it dry so he/she could parrot it to the public with a straight face!! Any so called 'comets' would have aeons ago became part of the central star inasmuch as most ALL comets are in long elliptical orbits or in their star's Oort Cloud, etc. We would see similar in our own system and we do not. Our system is typical of what is in the wild. Just wait till some Russian prospector finds some artifact on one of the 'asteroids' here while mining. And by the way the 'Guv' is being Awful QUIET about those lights on Ceres lately. What do they REALLY know and WHEN did they KNOW it??! A light curve caused by the destruction of a family of comets would repeat at approximately equal intervals. Another "Haw Haw" farcical so called 'explanation' that can only be 'accepted' by coercion. Unfixably delusional, put in "loss sector" of human progress. Yeah! Thank God the initial pictures were "leaked" to us by an anonymous group known only as NASA.gov. Without NASA leaking those pictures of Ceres the government might have been able to keep them entirely secret! Those brave individuals working at NASA for the good of mankind above all else have my eternal gratitude for sharing the truth with us. Osiris1 makes a good point though, the lights of Ceres are seen to be emitting even when the rotation and reflective angle dictate that it would be impossible for it just be a reflection. I am also very sceptical of the idea that this could be a comet as it would have to be phenomenally large to blot out so much light.